Promoters of nuclear plants need patience and deep pockets. That’s the lesson being reinforced for India—from a showpiece project in its backyard and another in Finland, where French company Areva’s flagship project, is running into time and cost overruns. Both have implications for India’s programme of taking nuclear generation capacity to 470,000 MWe by 2050 as Prime Minister Manmohan Singh announced in September last year. It is an absurdly optimistic target, say nuclear analysts, because the current capacity is 4,560 MWe. The first of the warning signals comes from the Kudankulam project in Tamil Nadu’s Tirunelveli district where the Russians are setting up two reactors of 1,000 MWe each. Kudankulam, launched in 2002, is three years behind schedule, but is entering the final lap, according to the state-owned Nuclear Power Corporation of India (NPCIL), which is partnering the Russian Atomstroyexport in building the two reactors. 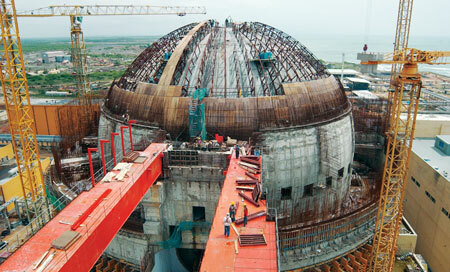 NPCIL is the only entity authorised to construct and operate nuclear power plants in the country. There was a frisson of excitement towards April end when dummy fuel assemblies were uploaded into the core of one of the reactors. This is done to assess the reactor’s performance before the actual uranium fuel is used, and marks a milestone in construction. But the celebratory mood in Kudankulam was tinged with concern since the first reactor might be commissioned only in December this year—if the remaining work is completed according to schedule. “We are trying to commission unit I of Kudankulam in the third quarter of 2010-11 and unit II about six to eight months later,” said Sudhinder Thakur, NPCIL’s executive director. He explained the delay was caused by Russia’s failure to provide components in time. “Towards the end, only small value equipment, but critical for completion, was delayed. Imports for unit I are nearcomplete and all activities are now in our domain.” Chairman and managing director of NPCIL, added that the project had given them valuable experience in setting up large reactors. Thakur did not disclose how much the delay has added to the cost of the Rs 13,171-crore Kudankulam project. Experts say price escalation is unlikely to be of the magnitude that Areva is experiencing with its Olkiluoto 3 project, using the European pressurised reactor (EPR), in Finland. Olkiluoto 3, three years behind schedule, has seen additional cost of €2.7 billion (Rs 16,343 crore) against an initial cost of €3.2 billion (Rs 19,370 crore). This has plunged state-owned Areva into the red. Not a good augury for India, which sees Areva as the next partner to push the country’s nuclear power agenda. Official sources say NPCIL is working on a business model with Areva to build two 1,650 MWe EPRs in Maharashtra. Although they claim it will be similar to the deal with Russia, this is next to impossible. The Kudankulam deal was signed in the Soviet Union era when India was an ally, and most of the tabs are being picked up by the Russian Federation now. India has paid 15 per cent of the cost and the rest is reportedly to be repaid in 12-14 instalments after commercial operations start. Besides, the Russians have assured Kudankulam fuel for its life cycle. Areva’s mess in Finland is bound to cast a shadow over cooperation with NPCIL, although some experts point out that the industry is used to delays. “Construction of nuclear reactors has always taken much longer than, say, natural gas-based power plants,” said M V Ramana, physicist and research scholar at Princeton University. “The time period increased significantly after the mid-1980s following the Three Mile Island and Chernobyl accidents. As per the International Atomic Energy Agency’s data the average construction time is close to nine years. In most cases, the anticipated construction time was about five years,” he said. Even if delays are a given, other issues such as who bears the liability make the Areva project and those by Americans shaky (see ‘The nuclear gamble’, Down To Earth, October 1-15, 2009). The issue is not just the amount of compensation to be paid in the event of an accident but as to who will be landed with bill, the operators or the suppliers, and to what extent (see ‘Beyond Bhopal’, Down To Earth, July 1- 15, 2010). Private Indian players who wish to set up nuclear power projects in the country want to pass on part of the liability to the suppliers and are thus stalling the passage of the nuclear liability bill. Among the companies that have expressed interest in entering the field are Reliance Industries and Tata Power. Kudankulam enjoys other advantages that the new entrants do not; it has been sanitised as far local opposition is concerned. This is not the case with Jaitapur project in Maharashtra and Mithi Vardi and Jasapur in Gujarat. Communities that face displacement are on the warpath and in both cases the environmental impact assessment reports and pre-feasibility reports of NPCIL have been found to be faulty, sparking fresh trouble for the project promoters. All the same the country’s sole nuclear power producer is banking on larger environmental concerns related to climate change fears to push its agenda. Although coal and gas-power plants are far cheaper and faster to set than nuclear, sections of the green lobby have been championing nuclear power because of its low-emission plants. While that debate rages on, NPCIL has learned that ambitious targets on adding new capacity could bite the dust for various reasons. Its most immediate problem, however, is the shortage of fuel that has brought its plant load factor (PLF), or the level at which each project is operating, to low levels. Part of the problem was taken care of with fuel imported from the Russian Federation and Kazakhstan last year. Where does this leave India, with its target of ramping up capacity to 470,000 MWe? Not even at the take-off point. Take just the target for the XIth Plan which has been scaled down significantly. Thakur is confident that NPCIL can nudge it to 7,280 MWe. In this case the arithmetic is straightforward: 220MWe from Kaiga-4 in Karnataka, Kudan - kulam I & II 2,000 MWe and the fast breeder reactor (FBR) at Kalpakkam 500 Mwe. That is, a total of 2,720MWe. After that, the prediction is inheren - tly more uncertain because it is dependent on political factors. Ramana’s guess is that India will see one set of twin reactors from the big players, France, Russia and the US, at each of the sites allotted to these countries although the US gets two sites because of the civilian nuclear agreement it pushed with India. “It is plausible that the 20,000 MWe by 2020 might materialise, but I doubt if one can have the targeted 40,000 MWe by 2020,” predicted Ramana. As for Manmohan Singh’s target, that is clearly a pie in the sky. Deep pockets: Yes in the first instance, but look at the operating costs about 10% of the total cost out of which fuel cost is again half, other half being enrichment and fuel fabrication. So they are compareable to renewabales in the setting up costs and to coal thermal in terms of base load geneartion. That makes an econmic case for nuclear power. additionally we do not forget the emmissions of coal. Delays: While there has been delay in Kudankulam project, mention of TAPP-3&4 and Kaiga-3 which were completed in five years from first pour of concrete would have made the report balanced. No one picks up the tab: The project is funded about 50:50 through Russian credit which comes with interest and domestic sources. a)the mining, processing and transportation costs of nuclear fuels? b)environment and health costs associated with these processes? c)what about the nuclear damages liability costs? d)what about the storage costs of the spent fuel which need to be safeguarded for thousands of years? e)what about all the direct and indirect subsidies and tax holidays given to nuclear power industry? In a related article Dr. Ramana has shown that the cost of a 235 MW nuclear power unit at Kaiga is much more than that of a comparable size coal power unit at Raichur, both built at about the same time. This is not to argue that coal power plants are better than the nukes to our society. An objective look at all the costs to the society and alternatives available to us can indicate that none of the large size conventional power sources are in the best interest of our society. An integrated resource management approach involving highest possible efficiencies, effective demand side management and widespread use of small scale renewable energy sources, alone is the sustainable answer. Are we game enough to accept this reality? These things are oxymoron to Govt. run institution (NPCIL) which is controlled by a corrupt politicians. By 2050, Manmohan Singh won't be there, so he doesn't care, whether they achieve the capacity, he says we will. But Nuclear power is the only option considering our natural resources will be running dry. China is buying mining rights all over the world, so they will be next middle east that all countries will depend on them. Yes the projects are experiencing delays and cost overruns, but show me any project that is on-time and under budget. They are far and few between. If it runs under budget the politicians will swoop in and take "care" of it. This is great news and very historical movement for us. Mr. Thakur can you answer one simple question. Where does a country like India store the Nuclear waste? You, more than anyone else know the seriousness of the issue of storing nuclear waste. The United States stores its nuclear waste deep inside the Yucca mountains of Nevada. At the current rate the united states can continue to do so for the next 200 years. After that it will run out of space and will have to look for alternative space. So coming back to India... where does India store its nuclear waste - we do not have any thing on the scale of the Yucca Mountains. More over, there is still the specter of a nuclear leak. Or maybe you don't know what that is??? Allow me to demonstrate just how bad that can be. These are all in the public domain. There are others that are not so well known. I have met people who have lived in the erstwhile soviet union when Chernobyl happened. I'll leave it to your imagination to comprehend the untold stories of suffering that have emanated from this condemned site - the stories of radiation sickness, the deformities to newborn babies and other unmentionable maladies that I have heard first hand. But try and get a grip on this.... Chernobyl - the epicenter of the disaster and land WITHIN A 100 MILE RADIUS IS COMPLETELY DEVOID OF ANY LIVING HABITATION - NO TREES, NO ANIMALS AND CERTAINLY NO HUMAN BEINGS. It is a desolate place - stuff that futuristic scifi movies are made of. Even one Chernobyl were to occur in India - God Forbid ... Will you then justify the cost as you have done above?????? Do you know what happened to the pilot who commandeered Enola Gay?? If you dont, I would advise you to find out... its there on the internet. I 've read this news about this nuclear fake deal!! i wrote an article about Jaitapur and its people that is fighting for a basic right....live healthy in their own land. Visit my blog is in italian, english and spanish.